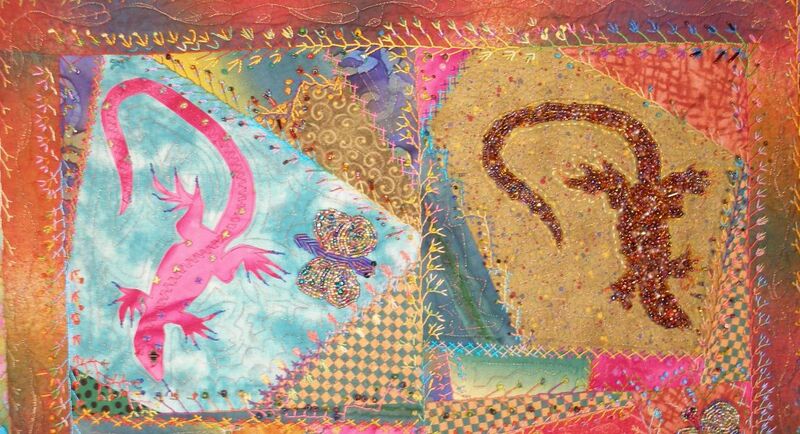 In this pattern for fusible applique, there are full sized drawings of a lizard (he is about 7" long x 6" wide), three butterflies (one for a beginner beader), a wren, a dragonfly, and a snail. The instructions explain how to do raw edge machine appliqué, hand embroidery (crazy quilt stitches) and hand beading. Not all these designs were used on this quilt. Having additional designs gives you the ability play many options, so your quilt will be unique. The instructions assume you have never done applique, crazy quilting, hand beading or hand embroidery. There are complete instructions for raw edge machine appliqué using a darning foot, crazy quilt block making, five embroidery stitches, and some variations on these stitches to embellish the blocks, two methods of hand beading, machine quilting, binding the quilt, and signing your name freehand on the sewing machine. This is the intensely beaded lizard with four different kinds of beads. Instructions are included. The butterfly was beaded with strings of beads that were couched down to keep them from moving. 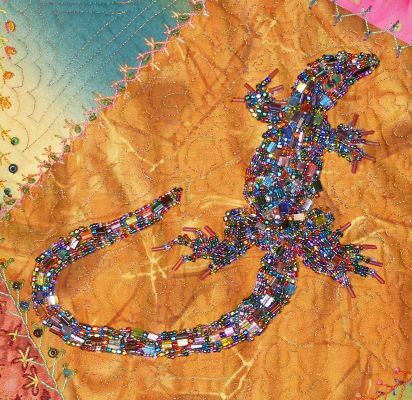 French knots adorn this lizard's stripe down his back and seed stitches add texture.